First Lutheran Church in what became the Town of Berne Submitted by Harold Miller - Published in the Altamont Enterprise 1 August 2002 Dominie Peter Nicholas Sommer (1709-1795), a Lutheran pastor born in Germany, who lived and ministered in Schoharie from 1743 to 1789, provided the earliest known Lutheran ministry in what is now the Town of Berne. His journal says, "February 1765. I preached for the first time in Johannes Zeh's house and administered the Lord's Supper." "April 1766. I administered the Lord's Supper at Beaverdam." This second service was probably also held at Zeh's home. Picture his crude log cabin on a cold day in early spring, smoke drifting from the stone chimney, and set in a clearing surrounded by stumps, ringed with towering virgin pines and oak trees. Inside, a few families dressed in rough homespun are crowded around the fire to take communion with the Lord. Before the Town of Berne was created in 1795, the area was called Beaverdam, or the Beaver Dam. It was in the Town of Rensselaerville, which encompassed all of the Hilltowns on the Helderberg Plateau in Western Albany County. Thus, when the newly formed Lutheran Church was incorporated in 1790, it was named the "German Lutheran Congregation of Rensselaer Ville." The first trustees were Christian Sand, Frederick Warner, and Christian Zeh, a son of Johannes, at whose house Dominie Sommer had administered Communion in 1765. It was several years later that the congregation constructed their first church building, halfway between what are now the villages of Berne and East Berne, just east of the present-day Pine Park, a small residential area of modular homes. A 1787 Van Rensselaer survey map shows the site of the future church as being an unleased 71 acre lot on the southwest side of what is now the Helderberg Trail, State Route 443; the Pine Park homes are now in the center of that lot. The church would be built in the northeastern corner of the lot. Although the lot was not leased, it was not vacant; on its western edge was a sawmill on Fox Creek. The Van Rensselaer survey book remarks about the 71 acre Lot 564, "This is a Middling good Lot, Well Watered by the foxen Kill [Fox Creek] on which is a fine Saw Mill, with a gang of Saws. The Werners [Warners] & See's [Zehs] are the Chief proprietors of it. Chiefly Pine & Oak Timber." More than two centuries later this area is still dominated by pines. Johannes and his brother Christopher Warner built their sawmill in 1765, according to Munsell's History of Albany. It was the second sawmill in the Helderbergs, the first having been built a decade earlier by Jacob Weidman, a couple of miles to the west, below the falls, in what would someday be the village of Berne. Like all early settlers in the area, the Warners and the Zehs were squatters, and did not start paying rent to the Dutch Patroon, Stephen Van Rensselaer III, until he had his land in the Helderbergs surveyed in 1787. Although the survey map shows no lessee for the sawmill lot, adjoining land was leased to Christian Zeh and Johannes Warner. For at least a century after the sawmill was built, it continued in existence. An 1866 map of Berne shows an "F & S Mill" [Feed and Saw Mill] in the same location. The foundations of the mill, as well as the ruins of the milldam and millrun are visible today. Since the Zehs and Warners operated the sawmill, lived on adjoining lots, and were trustees of the newly organized church, they must have been instrumental in selecting the sawmill lot as the site for the new church building. Although the first pastor recorded after incorporation was Rev. August Friederich Meier, it was Rev. Heinrich Ludolph Sparck who became the first settled pastor. On June 28, 1796, undoubtedly on the advice of the Church Trustees, he leased the 147-acre Lot 563, immediately west of the sawmill lot and Fox Creek; it was the only vacant lot adjacent to the sawmill lot, future site of the church. To reach his new farmstead in the wilderness, Rev. Sparck first cleared the trees to build what is now Kaehler Lane. He had to farm his land, since the salary his poor farmer parishioners could pay would certainly not have provided a living. Since the millpond on Fox Creek was between his farm and the church, to walk to work, Rev. Sparck would have crossed the creek on the milldam. The following summer the sawmill lot was leased to the Lutheran Church. The Van Rensselaer lease book says, "[Lot] No. 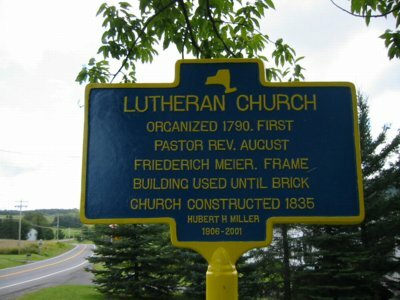 564 Cont'g 71 Acres - Lutheran High Dutch Church at the Beaver Dam in the Town of Rensselaer Ville in the County of Albany - Christian Zeh, Frederick Warner & C. Zandt [Christian Sand] Trustees - deed dated 27th July 1797. Usual Conditions." While officially the new church was called the "German Lutheran Congregation," the Van Rensselaer lease records referred to it as the "Lutheran High Dutch Church." "High Dutch" meant its congregation was German, or Deutch. The early pastors were German, and church records were in German until 1802. Several miles to the west was "The Reformed Protestant Dutch Church of the Beaverdam," which had been organized in 1765. This too was a "High Dutch" church with a German congregation. Van Rensselaer was "Low Dutch," as were most of the settlers on his lands below the Helderberg escarpment. The few Dutch settlers on the Helderberg Plateau lived along the top of the escarpment and attended a "Low Dutch" church below the hill, in New Salem. Although two years earlier the town had been officially named "Bern," Van Rensselaer, and others, continued to refer to it as "the Beaver Dam in Rensselaer Ville" for up to a decade later. It took a while to get used to the new name. Since the Van Rensselaer family did not actually sell their land, which encompassed almost all of the Counties of Albany and Rensselaer, the church "deed" was actually a long-term lease. The "Usual Conditions" might have referred to an annual payment of nineteen bushels of good, merchantable Winter Wheat, four fat fowls, and performance of one day's service with carriage and horse at the Manor house of Stephen Van Rensselaer, in the far-off Hudson valley town of "Water-Vliet." The first Lutheran church was probably built late in the summer of 1797. The simple frame structure was about 40 by 50 feet with galleries on three sides. Zeh and Warner, as church trustees and operators of the nearby sawmill, undoubtedly donated the lumber. Fred Lendrum, now one of the oldest living members of the St. Paul's Lutheran Church, Berne, was told that bark slabs were used for the church siding. Slabs from the first cut were basically a waste product of the sawmill -- thin edges, lots of bark - and were usually used for firewood. Because of the size of the virgin trees, perhaps three to four feet in diameter, it might have been the second cut that was used to side the church. These boards would still have lots of bark, but be considerably narrower than the wide boards that could be made from these large trees. Because of the difficulty heating a slab-sided building, it was probably not used in the winter. The simply constructed building was probably in bad shape when, less than four decades later, the Lutherans decided to construct a new church. The congregation had grown considerably, thanks in large part to an influx of "foreigners" - New England and downstate farmers of British, Irish, Dutch, and Scottish ancestry, attracted by Van Rensselaer's promise of "free land" to Veterans of the Revolution. It was because of these new members that English became the adopted language in the Church back in 1802, just as it was the common adopted language of the congregants. At some time in the early 19th Century the name was changed to the Zion Lutheran Church. In the years since the church's construction, the village of Berne had grown up around Weidman's saw and gristmills, a couple of miles to the west. In 1835 the re-named St. Paul's Lutheran Church built an impressive redbrick church on the western outskirts of the village, on land adjoining the farm of Peter Ball. The original dilapidated frame building continued in intermittent use for a few more years.